Just a cold — or something worse? | Checkup | Kids VT - small people, big ideas! Just a cold — or something worse? All children get colds and often pass them along to their parents and siblings. There are more than 200 different viruses that cause colds and upper respiratory infections, which is why we keep getting them throughout our lives. This month, Dr. Lewis First, chief of pediatrics at Vermont Children's Hospital at Fletcher Allen Health Care, offers advice on how to prepare for the upcoming cold and flu season. KIDS VT: How common are childhood upper respiratory infections? LEWIS FIRST: Colds are the most common reason children miss school and why parents bring their children to the doctor. Most otherwise healthy children are going to average five to 10 colds a year in the first two years of life — and that number nearly doubles for kids exposed to secondhand smoke. Colds require supportive care, not antibiotics, and will get better with time. KVT: What are the most worrisome complications from colds? LF: We worry about children who are so congested that they're having trouble breathing or can't stay adequately hydrated. Because infants and toddlers have smaller airways, they tend to be most inconvenienced by congestion. But mucus helps keep the germs out and is part of the healing process. Keep kids' noses as open and moist as possible and their bodies adequately hydrated, and they'll get through it in three to five days. KVT: Are there risks to giving infants and toddlers over-the-counter cough and cold medications? LF: Yes. These carry side effects including sedation, irritability and, most concerning, abnormal heart rhythms that in some cases can result in fatalities. Some of these medications say right on the package, "Not to be given to children under the age of 2." KVT: What do you recommend instead? LF: Good ways to deal with a cold are adequate hydration, saltwater nose drops, a cool-mist humidifier and perhaps a little petroleum jelly on the soreness around the nose. Some acetaminophen or ibuprofen can be used if they're uncomfortable with a fever. Saltwater nose drops can be purchased over the counter or made at home with eight ounces of water and a teaspoon of salt, but only use a few drops of that solution in an infant or child's nose. KVT: How do parents differentiate between a cold and the flu? LF: The flu, or influenza, affects more parts of the body than just the nose and throat. It comes on more suddenly, so it'll feel like you've hit a brick wall. You may get a headache and chills with a fever. Usually people with the flu feel a lot sicker. They ache more, have a dry cough and are much more fatigued. While most colds last a few days, the aftereffects of the flu can last weeks. KVT: How can parents "diagnose" a cough? LF: Different coughs can mean different things. A barking cough may be associated with croup, or an inflammation of the airway, and may require the use of a steroid. A cough that occurs in cold, dry air, at night or with exercise may be asthma. A persistent cough that won't stop may be whooping cough. A cough lasting more than a week with a fever as well may be associated with pneumonia. The sudden onset of a cough in an infant or toddler may be caused by a foreign body that went down the wrong pipe. KVT: When should kids be seen by a doctor? LF: If kids are having difficulty breathing, if they're not urinating frequently or seem lethargic because they can't hydrate, they should be seen. Also, if cold symptoms last more than a week or if they're associated with pain in their chest, ears or sinuses. Sometimes a "super-infection," or bacterial infection, settles in, which may warrant antibiotics. KVT: What are the risks and benefits of the flu vaccine? LF: The American Academy of Pediatrics and the Centers for Disease Control and Prevention recommend that all children and adults get the flu shot. The risks of getting the flu and how debilitating it can be far outweigh any risks of the vaccine itself, which is usually associated with a mild fever and some soreness around the injection site. Parents should talk to their health care provider about which type of flu shot is best for their child. 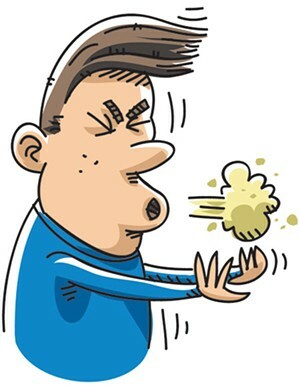 KVT: What is pertussis like? LF: It can be a life-threatening illness, particularly in younger infants. In older children and adults, it may just present as a cough that doesn't give up. It starts as a cold but lasts more than a week or two. Then it becomes a dry, persistent, machine-gun-like cough that prevents the child from taking a breath, so when she finally does, it sounds like a whoop — hence the name whooping cough. In younger children, it can lead to continuous coughing to the point where children can't take a breath. Children with pertussis have ended up in our intensive care unit, and some have died. KVT: Your view on the vaccine? LF: Some studies have shown that 80 to 90 percent of the people in the home of someone with pertussis will get the bacteria. The vaccine is at least 90 percent effective but doesn't necessarily last into adulthood. In Vermont, we have seen an upsurge of life-threatening cases. We can't prove cause and effect, but there's certainly an association with the decline in parents who want their children immunized. California and Washington state have seen serious outbreaks and some fatalities. We don't want that happening here.